We saw a ton of Yepps at Interbike a couple years ago…it looks like a good seat, and R DOES look happy! Did you take a look at the iBert, too? That seems to be a popular (and well-received) seat for the little ones. We did take a look at the iBert – our issue with that was that it didn’t seem to have the same degree of head support/cushioning as the Yepp. It also puts the kid in a more laid-back position rather than sitting up. 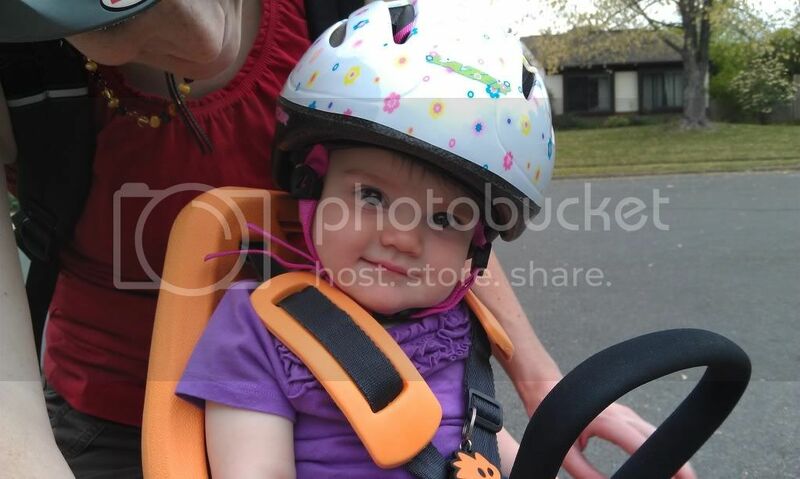 I wish I’d actually gotten a pic of the very first ride R took – she had a HUGE grin on! Of course that was gone by the time I had a camera ready! Just yesterday, I saw a guy riding with a little one in a seat like this. Don’t know what brand it was. The guy was a big fellow who looked to be well over 6-foot in height, and the bike was a large-framed hardtail mountain bike. Looked like there was all kinds of room for the little person and the adult’s knees and so forth. Yeah, taller riders probably won’t have as much of a problem with room. Really it’s a function of how long the top tube is and the angles involved (top tube, seat tube, head tube). A frame that angles the seat and the bars farther away from each other and/or has a longer top tube will be more likely to work. For perspective, this is a medium-sized frame with I think around a 20″ top tube. 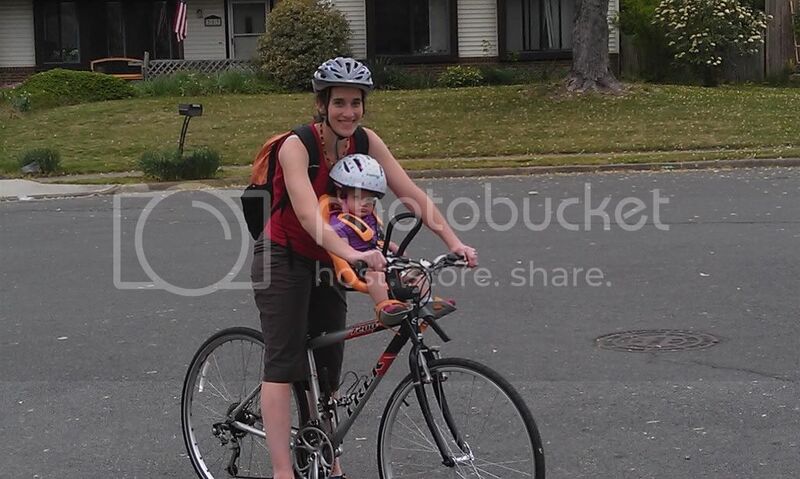 My wife is 5’5″ so she can’t ride anything much bigger than this (and at 5’7″, I generally can’t either). 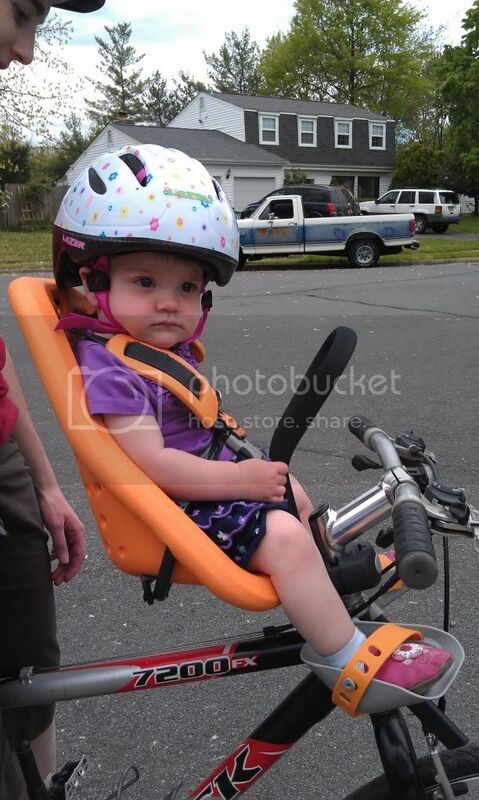 Matt – I second RL, I’m not a big baby fan, but your baby is one cute little pint of cyclist!